« Is Greece preparing to exit the Eurozone? So according to the latest report, Greek Prime Minister Alexis Tsipras has turned to Russian leader Vladimir Putin. Tsipras has accused the International Monetary Fund, the European Central Bank and European Commission – the so-called troika – of forcing “absurd” austerity measures on his bankrupt country and pushing Athens to the brink of default and out of the euro. Tsipras has lined up a meeting with Putin in Saint Petersburg on June 18. The concern in EU capitals and Washington is that Greece could break ranks over economic sanctions on Russia imposed over the Ukraine crisis, in order to secure Russian funds. The odds of a deal between Greece and its creditors getting done are now looking more remote after Tsipras cancelled a Friday session to continue negotiations with the creditors and backed out of Greece’s promise to make its scheduled €300 million loan payment to the IMF. 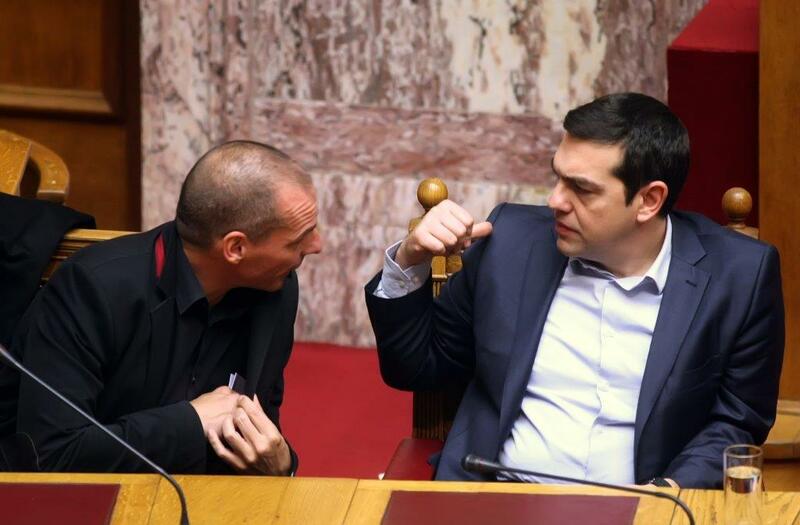 The reality however is that Tsipras is trying to quell a party revolt. The Left Forum of Syriza was opposed to making further IMF payments and is pumping for a default and Grexit. As the Socialist Worker journal reports, at the Central Committee meeting, SYRIZA’s leadership body voted for a resolution that promised continued resistance against the lenders’ extortion. But an amendment to the resolution proposed by the Left Platform went much further, calling for the government to “go directly on the counter-offensive with an alternative plan based on the pre-election commitments of SYRIZA” and to announce that it would not pay the next instalment due to the International Monetary Fund in early June. Among other measures, the amendment’s text called for the immediate nationalization of Greek banks and higher taxes on the wealth of the country’s rich and its large companies. But as Philip Stevens writes in the Financial Times, the Greeks might be guilty of hubris and over-estimating their importance here. The creditors should start thinking very hard about what strategies they can deploy to keep Greece from exiting the Eurozone in case of a default, which is now looking hard for even Angela Merkel to forestall. This entry was posted on June 6, 2015 at 6:10 am and is filed under Uncategorized. You can follow any responses to this entry through the RSS 2.0 feed. You can leave a response, or trackback from your own site.